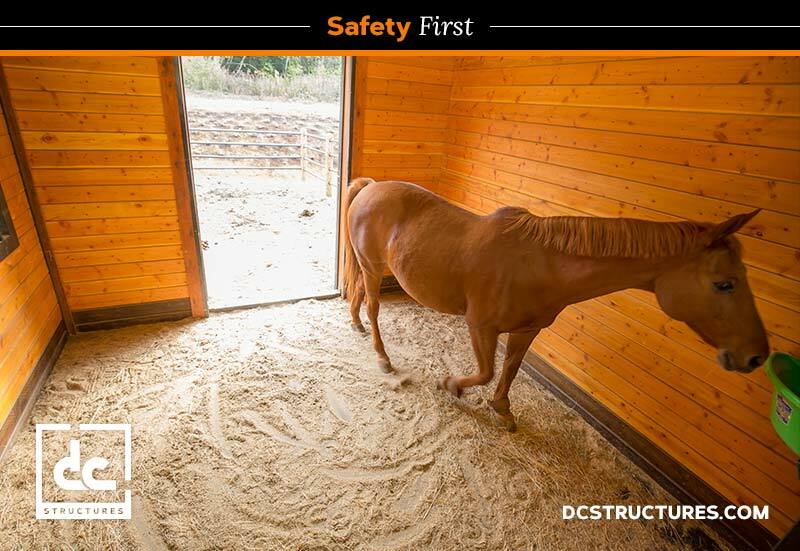 Horse barn safety is DC Structures’ top priority when it comes to designing our top-of-the-line barn kits. Injuries pose a real threat to horses, as the road to recovery can be especially arduous for them. There are a number of preventative measures you can take to ensure the safety of your four-legged equine friends. Read on for our recommendations for best practices. All barn materials should be free of chemical treatments as they present health risks to horses that chew on them. DC Structures uses top-grade untreated lumbers for its post-and-beam kit designs. The areas within and around a barn should always be free of clutter. Loose items scattered about the aisles are a safety hazard. Walkways should be no less than 12’ wide to allow horses to pass freely and turn around with ease. DC Structures’ barn kits all include plans that meet this requirement. The aisle ways should have an even and well-tractioned surface. Textured concrete or dirt without rocks are both great options. Stall fronts should have smoothed edges to avoid injury to the horse. All DC Structures horse barn packages include Classic Equine’s powder-coated, pre-galvanized steel stall fronts, designed specifically to protect your horse from scratches. The only direction a stall door should swing is outward, as inward-swinging doors can create potentially dangerous situations for caretakers if the horse is anxious to get out. Barn lighting should be mounted high away from a horse’s reach, or otherwise secured within strong wire casing. Floor-to-ceiling height should be adequate for rearing horses. DC Structures designs its barn kits with a minimum of 9’ from the floor to the ceiling. To learn more about DC Structures’ top-of-the-line horse barn kits, request our digital catalog.